(Nanowerk News) Researchers from the Institute for Advanced Chemistry of Catalonia (IQAC-CSIC), with support from the Nuclear Magnetic Resonance Service of the Universitat Autònoma de Barcelona (UAB) have developed a method for synthesising organic molecules very selectively, by assembling simple molecules and using an enzyme from E. coli (FSA: D-fructose-6-phosphate aldolase), which acts as a biocatalyst. This is a significant step forward since it replicates the formation of carbohydrates in conditions resembling those that presumably initiated life on the Earth (prebiotic conditions) and because it allows relatively large organic molecules to be obtained very selectively and efficiently. Furthermore, it is a process with few steps, that does not use organic solvents and generates no waste, and it has great potential in chemistry, especially for obtaining molecules and active ingredients of interest (drugs, supplements, etc.). Pere Clapés, a research professor with the CSIC who led this project, explains that in the synthesis of organic molecules "...it is not only important for them to have the correct structure, but also the right angle and position in space, because this affects their function". In fact, this is one of the main problems that can limit the effectiveness of compounds like drugs. In the case of pentoses and hexoses, these are simple sugars (monosaccharides) with five and six carbon atoms, respectively: crucial for life thanks to their function in energy production, structuring, communication and cell-cell recognition. The results presented in the journal Nature Chemistry ("Asymmetric assembly of aldose carbohydrates from formaldehyde and glycolaldehyde by tandem biocatalytic aldol reactions") show that the scientists obtained pentoses and hexoses by assembling formaldehyde and glycolaldehyde, with a minimal modification to the FSA enzyme sequence. The enzyme FSA was discovered in 2001 and its physiological function in E. coli is still unknown. It is thought to be an ancestral enzyme, and that it is active before a broad range of compounds. 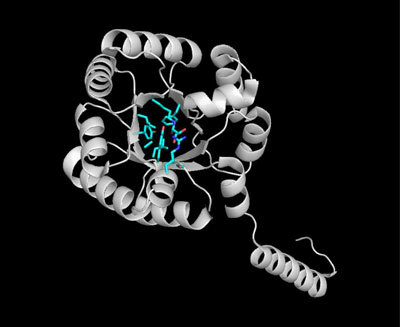 What surprised the researchers is that it is a very malleable enzyme, much more so than others. As a result, with only a small number of genetic mutations in the enzyme, its catalytic capacity can be modulated and increased significantly. This is what allows the enzyme to be carefully adapted in order to synthesise several molecules at will. The metabolism of carbohydrates in living organisms is a complex process, forged over millions of years of evolution. It is no easy task to carry out these processes in a flask, whether by assembling the enzymes involved in the process or by manipulating the metabolic pathways of living organisms. Nor is it simple to obtain carbohydrates with conventional chemical methods, which require several stages and the use of organic solvents. The procedure was developed by scientists in the Biotransformation and Active Molecules Group of the Spanish National Research Council (CSIC), with support from the Nuclear Magnetic Resonance Service of the UAB. Pere Clapés explains: "we want to prove that the tools of biocatalysis allow complex molecules to be obtained from simpler ones, which are in fact the same ones used in nature". He goes on: "Over millions of years, living organisms have forged these metabolic strategies to obtain the carbohydrates they need to survive." "The process is a simple one, mimicking the prebiotic formation of carbohydrates from compounds that were probably around in the world before life began", adds Teodor Parella, of the UAB. For these researchers, the engineering of proteins, in particular of biocatalysts, has enormous potential for the sustainable synthesis of natural molecules and their derived products.